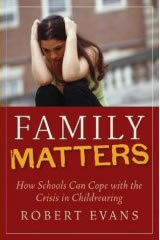 Rob's second book is Family Matters: How Schools Can Cope with The Crisis in Childrearing. Available online from Amazon, and Barnes and Noble, among others. It takes a sharp look at the enormous changes occurring among children and parents and the dilemma these changes pose for schools. Students everywhere are harder to reach and teach, their attention and motivation less reliable, their language and behavior more provocative. 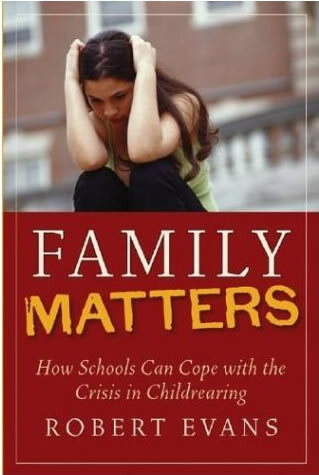 This is largely because parents, suffering a widespread loss of confidence and competence, are increasingly anxious about their childrens success, yet increasingly unable to support and guide themand increasingly assertive and adversarial toward the school. Examining these trends and their underlying causes, the book calls for a combination of limits and leverage. At the policy level, we must rethink our notions of accountability, accepting the reality that schools cannot overcome all the forces that affect childrens lives and learning. At the schoolhouse, educators can improve their impact by clarifying and asserting purpose (core values) and conduct (norms for behavior), and by becoming more appropriately parental vis à vis students and parents. The book outlines concrete ways to implement these measures, and closes with a reflection on ways to sustain hope and commitment in the face of unprecedented challenge. 1. "Something's Gone Way Wrong"